Opportunities are also cross-posted on AllForGood.org as well as custom sites powered by Samaritan for their customers. Volunteers can return to any page on the Samaritan network to check their schedules, report hours and take surveys. Hours recorded on VolunteerNow.com can be automatically shared with RewardVolunteers.coop, a no-obligation recognition portal operated by the Cabot Creamery Cooperative. Hours posted by volunteers through Facebook are also shared with Cabot. *Qualifying organizations must be current members of AL!VE and have an annual budget below $400K. 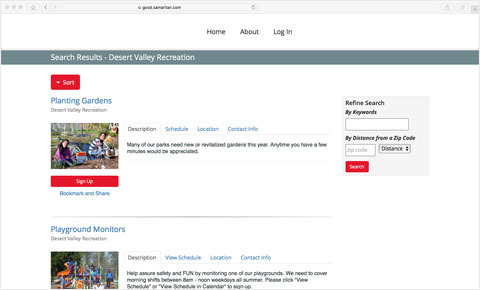 Grantees will be given access to Samaritan's #1 Rated Volunteer Management Software from which they can post opportunities to their page on VolunteerNow.com. When registering, volunteers can opt to participate in RewardVolunteers.coop, an entirely-optional no-obligation recognition system powered by Cabot. Prizes include everything from hotel stays to cruises (see current list here). This site, the software and all associations are designed purely to benefit communities and volunteers. If you are a small non-profit organization that desires to participate please complete the information on the back of this form and drop it off at booth #23, #55 or #58 at NCVS or email to sales@samaritan.com. For more info on Samaritan's #1 rated software please visit Samaritan.com.